Lake systems have intrinsic aesthetic, recreational, and ecological values. Every pond and lake is a unique ecosystem. 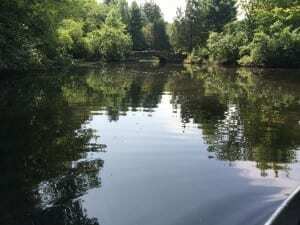 The quality of a lake or pond is a result of a variety of interacting factors including: water depth, turbidity/clarity, chemical composition, sedimentation, excess nutrients, temperature, and excess plant growth. These factors are essential to understanding the causes of potential problems with the water body. All Habitat Services, LLC offers a variety of professional lake and pond management services that will take you through investigation, assessment, planning and application. Whether your water body has nuisance plant growth or algal blooms, lack of water clarity, or a loss of volume due to sedimentation, All Habitat Services can work with you to restore your lake or pond. Aquatic plants play a variety of important roles in lake/pond ecosystems. They provide food and habitat to fish, wildlife and aquatic organisms. Plants also stabilize sediment and improve water clarity. However, nonnative or excessive plant growth can become problematic in a water body by hindering the recreational use, aesthetic value, and overall structure of the ecosystem. Invasive aquatic plants, generally defined as nonnative species that often cause ecological or economic harm to an ecosystem, are a growing concern for lakes and ponds. Invasive plants suppress the growth of native plants that can alter the ecosystem diversity and balance, and in some cases drive the native plant entirely out. Unmanaged, invasive plants may impede human uses of the water body, interfering with water flow, boat traffic and fishing, as well as harm the habitat for aquatic organisms and wildlife. In order to protect your lake or pond from this or manage for an existing infestation, AHS can provide you with our qualitative/quantitative plant surveys, invasive species inspections, and implement herbicide applications or mechanical plant removal. Another common problem to lake and pond dwellers is algae. While algae, provides the basis of the food chain in a waterbody, dense growth may cause the watercolor to appear green and unsightly. Algal biomass can be estimated by measuring the concentration of chlorophyll in the water; therefore, chlorophyll concentration is a direct measure of lake trophic state. Chlorophyll is also directly related to phosphorus concentration. Consequently, if your lake or pond has an influx of phosphorus into the system chlorophyll and algae will likewise increase. A lake with high algal growth reduces water clarity, which suggests high productivity. To assess your situation, AHS can conduct water quality and algal assessments as well as develop a management plan best suited to your lake or pond. The trophic state of a lake describes the overall productivity (amount of plants or algae), which has implications for the biological, chemical and physical conditions of the lake. For example, a lake system can be considered Oligotrophic (unproductive, with low nutrient levels and algal productivity), Mesotrophic (productive and may support abundant plant growth), Eutrophic (highly productive, with high levels of phosphorus and chlorophyll), or Hypereutrophic (algal growth dominates due to very high phosphorus and chlorophyll levels, typically due to excessive nutrient loading caused by human activities). Eutrophication is a natural aging process of lakes in which the ecosystem is enriched with nutrient that stimulates plant and algal growth. While the watershed and its geology determine the trophic state of a water body, human activity that causes nutrient runoff can shift a lake into a higher trophic state (cultural eutrophication), thus altering the water quality and productivity of the lake. Without human influence on nutrient loading, a hypereutrophic lake would rarely occur and eutrophic lakes may not occur as quickly or frequently. Another problem that arises as a lake reaches a higher trophic state, is an accumulation of sediment and organic matter. 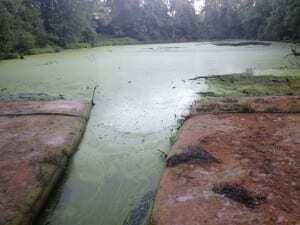 While eutrophication is a natural occurrence for lakes, human influence and invasive plants can severely speed up the time it takes for a lake to fill with sediment and become a wetland or marsh. 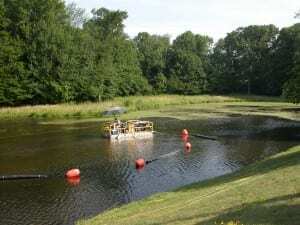 In this case, bathymetry mapping, nutrient source identification, and dredge planning for sediment removal may vital to restoring your lake or pond.